I hope that you don’t mind me emailing you, but I have a few questions regarding bespoke and made-to-measure suits that I need to ask someone who knows about style, and you seem to be one of the most knowledgeable on the subject. I’m looking to get my first tailored suit, and I think that I’ve settled on my tailor of choice which is Thom Sweeney (it was a decision between Tom Baker and Thom Sweeney, but I feel that Tom Baker’s style may be just a little too outlandish for my taste). The suit will initially be used for my wedding in Las Vegas, but after this I’m hoping to use it for special occasions and possibly the odd “suit” day at work etc. I don’t wear suits regularly for my job, and due to the costs, I’m hoping to get a multi-purpose suit, striking a good balance between formal & casual. So, onto my questions. I’m looking at getting a nice 3 piece, navy colour, maybe edging towards midnight blue. The cut of the suit in the picture above is absolutely stunning. However, I’m thinking of adding some extra personal touches, just to make it more of my own. Would opting for a M2M suit allow me to customise things such as the colour of the lining? I’m hoping to get a vivid green colour lining for the suit. Are bespoke buttons available? I was wondering if I could get buttons that had a very slim matching green rim to the button on the suit or waistcoat. Thing is, am I going to get laughed out of the shop if I asked for things like this? Would it spoil the suit? Is there anything else that I could do to make the suit that little bit more personal to me? I hope that you may have time to give me some advice on this, as I really am a little lost in the whole tailoring world! Let’s start with the easy questions first. Yes, a made-to-measure or bespoke suit will allow you to change the colour of the lining, and there’s quite a variety so I’m sure you’ll be able to find the green you want. Buttons, however, will be harder. There’s normally a choice of colours of horn, but you’ll struggle to find the green you’re looking for. You’ll have to source them yourself or – probably best in my opinion – stick with brown or black horn. You won’t be laughed out of the shop for either question. Thom and Luke are great guys and very open to style questions. As to things that could make it more personal, I would stick to picking out the cloth, and decisions like the number of buttons, lapel shape etc. – particularly as this is your first tailored suit and you want it to be versatile. But this moves onto the tricky area of casual/formal versatility. The suit you have picked out from my previous post is actually a midnight blue tuxedo – with satin-covered buttons and satin lapels. Thom and Luke will definitely make you a suit that is similar, but losing the satin elements to take it away from tuxedo territory. 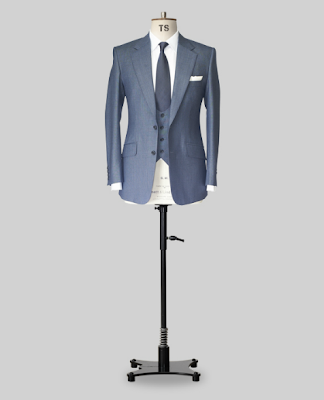 Above is a suit from their website lookbook which demonstrates this – albeit in a different blue and without peak lapels. 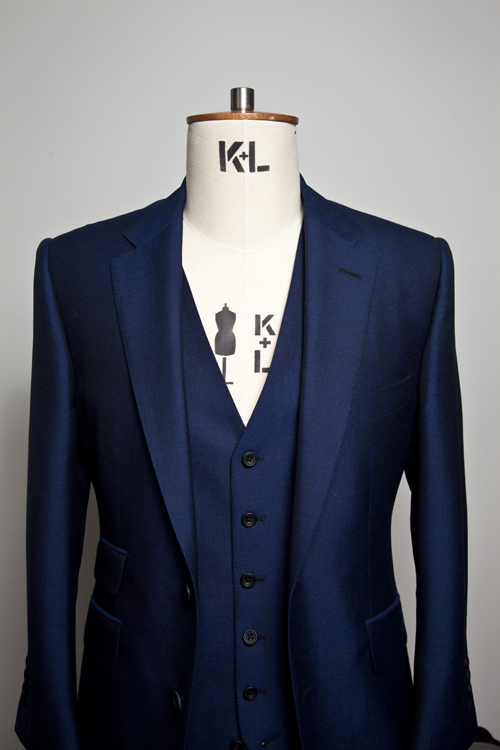 However, a midnight blue suit (with the Thom Sweeney trademark horseshoe waistcoat) is never going to be casual. It will be great for your wedding and for the office, but won’t be as versatile as, say, a tweed or woolen check. Indeed, nothing will bridge to gap between that and a wedding. They are at different ends of the formality spectrum. You can follow the discussion on A suit at Thom Sweeney: Reader question by entering your email address in the box below. You will then receive an email every time a new comment is added. These will also contain a link to a page where you can stop the alerts, and remove all of your related data from the site. That would be my worry too, spoiling a suit by asking for too many changes. Many many thanks for answering my question. Thanks for clearing up some of the points over what can be done for a M2M and Bespoke suits, and I can see your point over “playing safe” esp. with my first tailored suit. Either way – it’s reassuring to know that the Thom and Luke are good guys! Good advice and love the midnight blue 3 pc. at the top of the article. Out of interest, could you just take the waistcoat away from a 3pc suit to turn it into a 2pc, and wear it that way, or is a 3pc cut in a different way which would mean it doesn’t work like this? Is there then a case for having every suit you buy made as a 3pc, so as to add versatility? Assuming of course that it’s not made in a summer cloth. Sure, that certainly makes it more versatile. Though after two or three of those, you might be able to get a jacket for the same cost, which might be even more versatile..
I’m looking at dipping my tentative toe into tailored suits, and have a budget of just over a thousand pounds. I guess a made to measure is the obvious step, and although I already have an off the shelf blue suit, I’m thinking that’s the safest place to start (although I do quite fancy a brown suit…). For smart wear (ie important work and/or social occasions). Have you any recommendations on a tailor who won’t scare a ‘starter’ away? I had a fabulous Tom Baker suit made. He can do anything you want. I’m a banker and the suit was appropriate for my work. I just had a M2M suit from Thom Sweeney and it’s absolutely fantastic. There are quite a selection of lining to choose from and you will be spoilt for choice. If you want to have a dark navy blue suit, I would recommend the birdseye fabric. I know it’s a vulgar question to ask but I’m considering the same thing (M2M suit from Thom Sweeney)so I’m curious how much would something like that cost. Again apologies for being so up front. Thanks for all the comments and advice – Will certainly check out the birdseye fabric and the U-shaped waistcoats..
Simon. Love the blog. I’m also considering Thom Sweeney, in this case for a made to measure. Do you have a view on their made to measure programme in comparison with others in that price range (roughly a grand) and for MTM would a customer be dealing directly with Luke or Thom, or would it be a more junior member of staff? Cheers. Hi Mark, you’d certainly be dealing with Thom or Luke. I haven’t tried their MTM service or indeed many others, so I can’t really offer much advice there I’m afraid. But I do know they are introducing a second level of MTM, so it might be worth asking about that too. Hi, I would like to buy my husband a M2M suit for his 50th birthday, so ideally I would like to buy a gift voucher. Do you know if this is possible? I know that suits vary in price but I wondered if somewhere might do a basic voucher that you can “top up” to the final price? Most bespoke tailors, such as Thom Sweeney, will do that without any problem. They may not have a paper ‘voucher’ but you can easily pay the deposit, for example. Hi — Ia hve a similiar question about choice of tailors. My husband ussually has his suits from hackett but I would like to suprise him with a M2M or bespoke suit for his 40th birthday. I assume you would recommend bespoke? Readers Questions: I hope this is the right slot. I am aware that you have written great articles about having jackets made by Italian tailors- so I know I’m revisiting an issue. I would like a modern soft jacket in the Neapolitan style ( Panico would be my ideal). The process of fitting etc in Italy I couldn’t face, and as far as visitors are concerned they seem a bit expensive for what they offer. Is trying to instruct a local tailor impossible? Am I doomed to fail? . Are any of the visitors delivering in a reasonably ie not too protracted timetable and at reasonable cost. I accept the latter is subjective. In London there are a few options. I wouldn’t try and instruct a local tailor – in my experience they can make the jacket softer, take out some of the padding etc, but they never replicate the Neapolitan look (it’s a problem with coatmakers as much as cutters). There are visiting tailors from Naples like Solito and Caliendo. I’ve used both, and there is information on the site for both. Solito in particular starts at around €2000 still I think and visits once every 5/6 weeks. Caliendo is even more regular, every 2/3 weeks, but is almost twice as expensive (better finishing largely). At the current exchange rate, hopefully €2000 and a bit is reasonable? I am looking at a 3 piece MTM/bespoke suit for my wedding later this year and I really like the look of Thom Sweeney suits. Should I book an appointment at Thom Sweeney will I be looked after by a tailor or a sales person with regards to initial consultation and measurements. This will be my second MTM the first a two piece which I was not entirely as happy as I had expected, this was from a very reputable Saville Row tailor. So I want ensure I am being taken care of in terms of fit and finish. Secondly I was considering having bespoke shirts made which would be a trade off with the suit and I would go MTM if I don’t get the shirts made I think I would go bespoke suit, I would be interested in your views please. MTM would be handled by a sales person. For my money I would go bespoke, and leave shirts for later… You could also have shirts from one of the very good-value italians I write about, such as Simone Abbarchi or Luca Avitabile. Have you read about them? I just stumbled across this comment whilst saving pictures to take to TS myself. (many similarities in our situation so i thought I would comment) – I deal with Will, good guy. He is the sales person but can deal in both so will talk you over the options and differences. Either that or the guys in Bruton Place are also great. The price difference is around £1000 from MTM to Bespoke. Bespoke swung it for me because i knew i would regret it if I went MTM. – I also have shirts now made by Simone Abbarchi and Luca Avitabile as Simon mentions below. On balance if you were going to do it I would go to Luca. Simone does not come as often as Luca so you have to pay for delivery which means bespoke is only about 20-30 euros different. With Luca visiting more often the opportunity to have fittings is a bit easier, and the quality is higher. To me it is not worth the small difference in cost. I hope Simone starts visiting more often so delivery will not be an issue, because he is a great guy and has made me a great shirt. Thank you for your comments unfortunately I have seen them too late it would appear. I went down the MTM route and had my first fitting yesterday. Yourself or Simon may be able to help with the next part, when going through the trouser options I asked for turnups however, when the trousers arrived for me to try they did not have turn ups. I discussed this with the guys and was told they would order more material and add these. This is not my field at all and wondered if this was the correct “fix” or if I should be asking for another pair? Slightly disappointing given the occasion the suit is for (my wedding) I’m not sure if this alone or a few other little bits has sewn the seed of doubt and made me wish I had gone bespoke.. Just like to also add that some of these other little bits I mention above may be fixed in the alterations after the fitting but I’m not sure if they will given the limitations of MTM. Given the suit exists where would I stand if I wanted to switch to bespoke, I inderstand I would loose my deposit and there may be varying conditions by tailors but wondered if anyone else has done this? Either way, I am sure it will look great. You may regret going bespoke, but I may also regret not going MTM and not spending the cash on something else. I wouldn’t worry. They may just be altering MTM but it is Not done by the factory in Italy but in house (out sourced in house I don’t know) but I know from the RTW stuff they have done for me they do a great job. I personally would see what the trousers looked like re turnups and if your not happy ask for another pair, even if the 2nd pair was 1/2 price or something. At least you would have a spare pair. I would say that with any tailor it is their mistake after all, not you changing you mind. I am surprised though they didn’t come unfinished so there would be enough material to make the turn up.. Even TS RTW suits that (I think) are made in the same factory come unfinished. But I am sure they will do a great fix and you will hardly notice. Hope this is the right place for my question! I did look through your blog to see if I could find an answer, and there were some elements, but not all of them, so I present to you the entire conundrum. My boyfriend is out of suits (moth infestation that we finally managed to eradicate, but not before they made irreparable damage). While he’s at buying new ones, he’d like them to look properly nice 🙂 He certainly would love to go bespoke. We’ve set a budget aside: he could spend about 4000 pounds upfront, maybe 6000 if stretched over a couple months and we stop eating. He owns 1 half-wearable suit at the moment, and he needs to wear them 4 days a week in a City environment. We heard the rule of thumb is to have 1 suit/day a week you need to wear it? His shirts would really benefit from a refresh as well. He’s about average size in every way, so we’ve been hearing a lot of different advice, ranging from “you don’t need bespoke, RTW is the way to go”, to “go have 2 bespoke suits made and get used to a noodle diet”, and everything in between. Might be useful to add that he likes streamlined cuts, probably some kind of contemporary English style, 1-button suits with structured shoulders, narrow waists and legs on the slightly slimmer side. 1) Investment-wise, what should he do? Go have 1 bespoke suit made and buy a couple cheaper RTW to round off the week? Go quality RTW and start saving for a bespoke suit when he’s not in an emergency? Would he benefit from bespoke at all? 2) What would be the right bespoke/RTW brands for that budget and style? We were looking at Thom Sweeney, Cad & The Dandy, Tom Baker and Chris Kerr in the bespoke range, Richard James and Suit Supply’s better range in RTW, but in truth we have no idea (especially since bespoke prices are not that easy to find online). I saw you recommended Graham Browne, would they be comfortable with the kind of style I described? 3) And if he had a bit of money left for shirts, or say, Christmas comes around, what would be the good shirt-makers, visiting or not, that he should consider getting in touch with? Tl;dr would be: Moths killed all suits, City wardrobe for 30yo to start entirely over with a 4000-6000 pounds budget. Lots of moving parts there, around timing, budget, wearing etc. Overall, I would go with two low-priced bespoke suits, with my top recommendation being Whitcomb & Shaftesbury. That should cost around 3.5 grand. You then have three wearable suits, so one will get worn twice a week. Then over the next year plan to get a further two bespoke, using the first experience to learn what style etc you like, and whether it’s worth trying another tailor. Thank you so much, Simon! That’s a great, actionable answer to my convoluted ramblings. 1) Why Whitcomb & Shaftesbury, rather than for instance Graham Browne or any of the other guys? I’m assuming you’re referring to their “Classic Bespoke Suit” range – their idea to cut in London and sew in India sounds pretty astute. Is that what sets them apart? 2) If he were to go for a couple shirts in that same classical with a bit of a modern twist style, who’d you recommend? Ann, I’d suggest reading my coverage of Whitcomb & Shaftesbury as there is much more detail in there. Also read my pieces about shirtmakers Simone Abbarchi and Luca Avitabile. First time suit buyer here and am enjoying reading your posts!